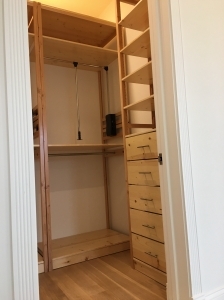 We recently moved into an 1898 Queen Anne Victorian in San Francisco which had no real closet space. 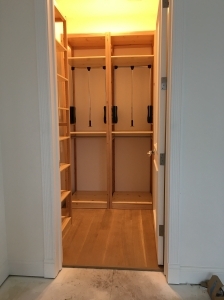 During remodeling, we cannibalized a small bedroom and made a master bedroom walk in closet. 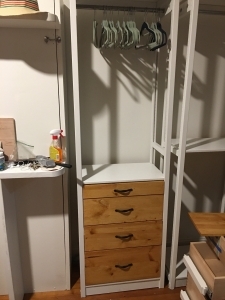 We shopped locally and online for a closet system as custom a design as possible AND wanted real wood, NOT plastic covered particle board. 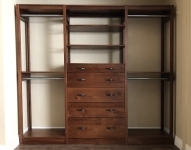 Custom wood cabinet makers were prohibitively expensive...LUNDIA was a great alternative. We worked with Lynn at LUNDIA for our design and ordering options. She could not have been more patient with our numerous telephone calls and emails. She was clearly as interested as we were in making sure the design, appearance, function and price of the closet system was appropriate to the space and our remodel as possible. 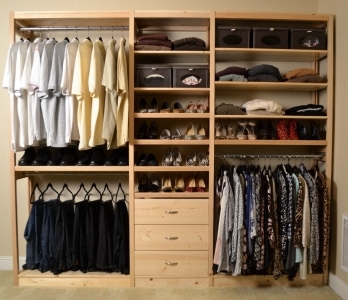 It helped greatly to know what your closet needs are for hanging vs. shelving space. 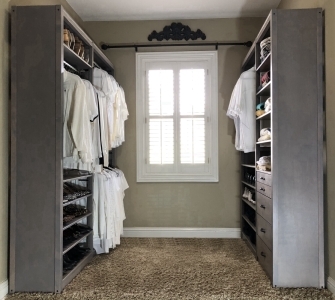 The LUNDIA design, function and pricing was comparable to the many closet system company options except the LUNDIA closet system is all wood. 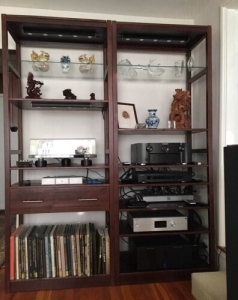 The finished product (ours was cherry stained) is clearly well made, engineered, inspected and without defects-- the packaging of the entire system was itself remarkable. 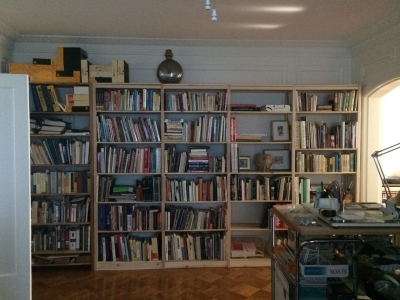 Assembly was not difficult though we went slowly to measure out even shelf spacing. The finished product looks great, is sturdy and remarkably functional. 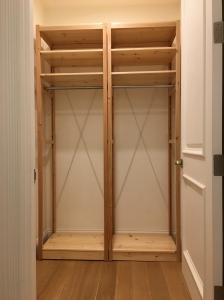 Don't forget to ask for closed end panels for the closet sides to the open shelving, though the design team will undoubtedly suggest this as an option. Very happy overall with LUNDIA ! I appreciate your customer service very much! I will definitely recommend you all to friends and family. My friend had horrible service with pottery barn of all places and that makes me not want to even shop there!!! So thank you!! Thank you so much. 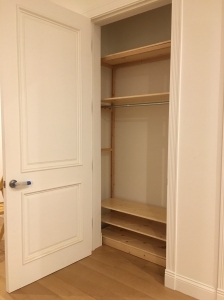 We're very happy with the closets! 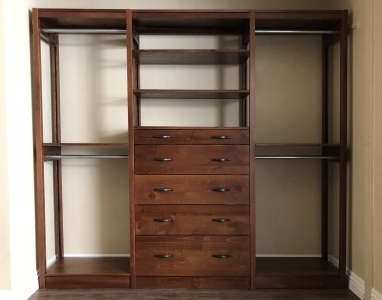 Once I got the hang of it, it was super easy to assemble. . 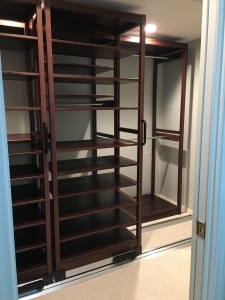 It looks totally custom installed and built in-even the shoe section fits perfectly!!! Thank you so much! 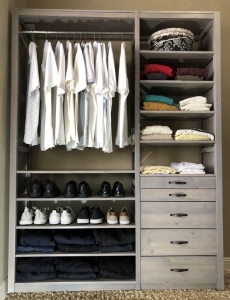 This came in half the price of The Container Store’s top of the line closet and California Closet!. I prefer real wood; I’m so excited. Thank you all very much! You guys are great!" 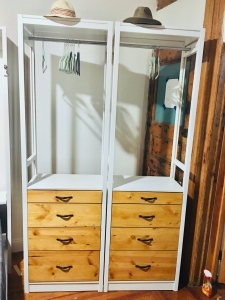 "I've been meaning to email you to let you know we love the closet components. I finally got them all stained and up and we are extremely happy with them! We will be back for more! Thank you again for all your help!" "Thank you very much. 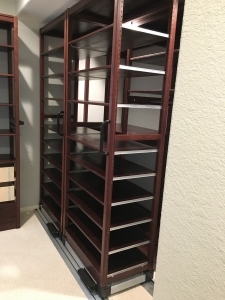 My parents LOVE their closets!" "The packing was very well done, please extend our happiness with your shipping crew. They really know how to pack!! We put it all together this weekend! It looks so awesome! 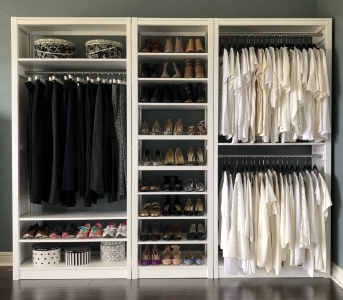 I love, love, love the closet. 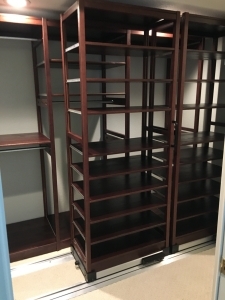 The sliding racks work great. 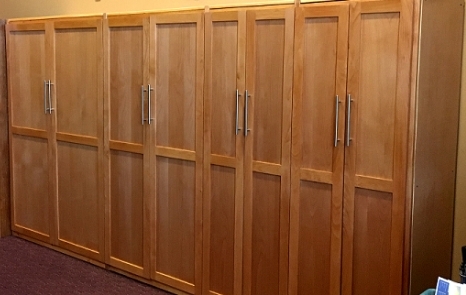 We adjusted one of the racks to better fit Marc’s shirts, and it was easy to do. We’re very happy with the system. Connie and Marc S., Murrieta, California "
"Thank you so much. You guys have been absolutely wonderful to work with on this project. 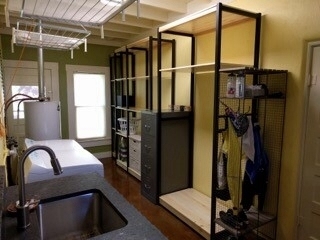 It is so nice and EVERYONE that sees it loves it and asks where we got the shelving from. 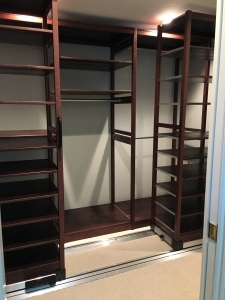 It’s turned out so nice that we may not put the doors back on the closet!" "Thanks so much for your super response! Dealing with Lynn and Jes has always been a real pleasure. They have been attentive, responsive, knowledgeable, etc.. 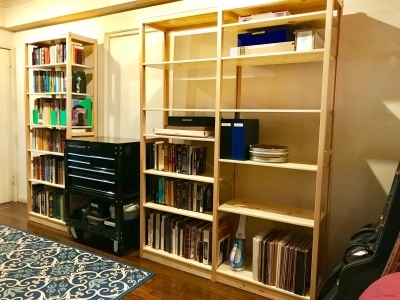 If I had known this was going to be this easy and fun to assemble Lundia shelving, Lou and I would have assembled the Closet and Man Cave ourselves and saved ourselves a bundle of money—and had all the fun to boot." "We Love Them! :) Orion worked so hard, staining and painting!" 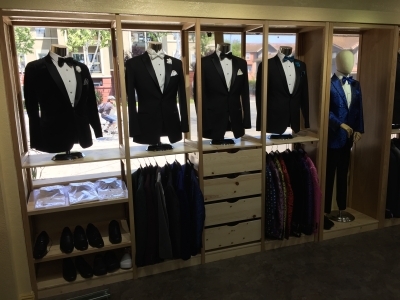 "This year we decided to give our store a fresh new look. 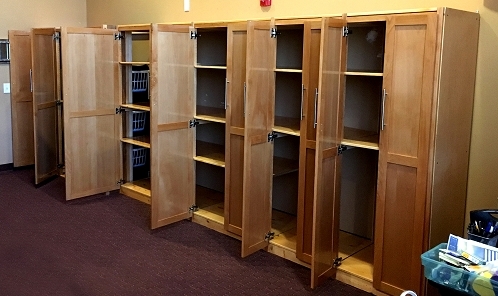 After extensive research we decided on an all wood, natural finish drawers, shelves and garment racks system from LundiaUSA. Everything we needed arrived well packaged, undamaged, all components properly identified and with clear instructions for relatively easy assembly. 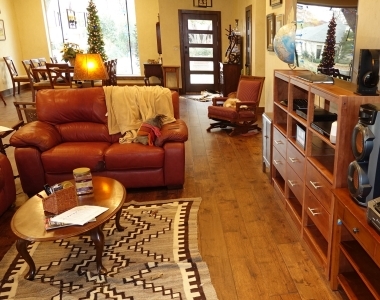 We're happy to recommend LundiaUSA for your home or business project. 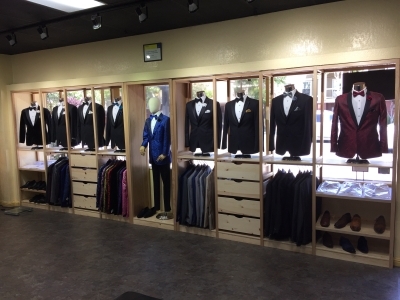 Feel free to contact us at Tuxedo Fashions in San Jose, CA"
The shelving looks wonderful. I want to thank you and your staff so much for all your help.